Earlier this fall, specialty brand Newton Running announced the launch of the latest addition to its footwear collection—the Distance Elite—with high praise from some of the best runners in the country. 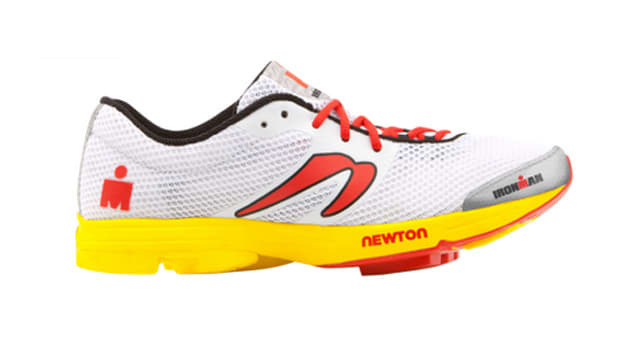 Now, with the release date of the Distance Elite nearing, Newton has decided to roll out a limited edition version of the shoe inspired by IRONMAN racing series. In terms of performance, the Ironman Elite is loaded the same features—like a 2mm offset, 4 Lug Rubber technology and EVA foam heel insert— as the Distance Elite. And like every other shoe in its repertoire, the Ironman Elite is laden with Newton’s proprietary Action/Reaction midfoot technology for forward propulsion. Where the two shoes differ is in the aesthetics department. Where the Distance Elite is featured in a Neon Green/Yellow color scheme, the Ironman version features a more modest White silhouette with Red and Yellow accenting. The shoe also features all-over Ironman branding, including on the toe cap, heel counter and side wall. The Ironman Elite is currently available for pre-order. The shoe will ship out on Monday, December 2.